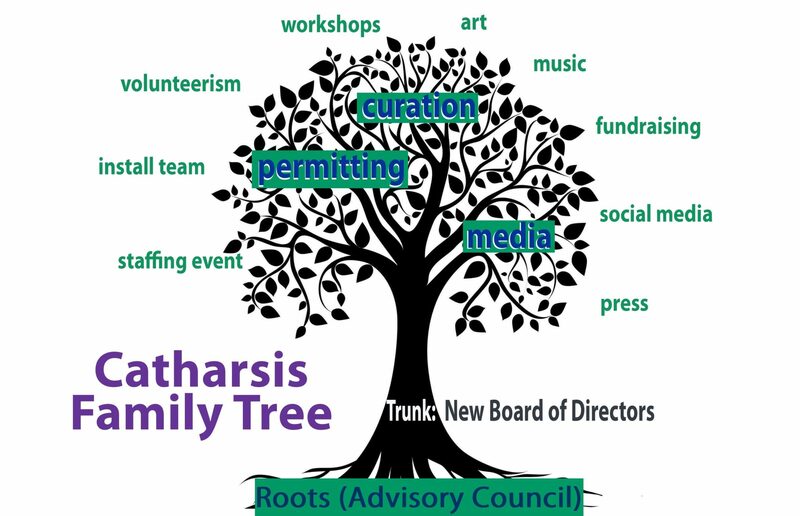 The Catharsis Trunk (“the Trunk”) determines and upholds how the whole Catharsis Tree aligns to our mission and growth. The Trunk provides nourishment, support and lines of communication for the disparate Catharsis Tree branches (departments). Volunteers, contributors and department leads exist in symbiotic relationship with The Trunk for life giving energy like the role of xylem and phloem*. Imagine the Trunk as the energy highway of our organism. Every branch from it begins with a leaf or a person who can expand the branch with participation like new leaves pushing upward. The leaves (people) grow and gather, under sun, feeding the whole organism, eventually creating flowers and bearing fruit. As we heal and change, we create a hopeful future in the form of new seeds emerging from our organism when people pick from the tree. Branches and leaves align and intermingle with each other in an interdependent network supported by the Trunk. * Plants have two different types of transport tissue. Xylem transports water and solutes from the roots to the leaves, phloem transports food from the leaves to the rest of the plant. The Trunk may decide what amount of a majority is needed to approve most decisions however at least 2/3rds majority is needed for the theme and budget decisions. Consensus is encouraged and Trunk members are encouraged to seek compromise to avoid having minority views deemed unincorporated in decisions. Trunk members are not entitled to special privileges, however they can nominate themselves to be department leads and but may not vote themselves as a lead. Members of the Roots may also be elected to the Trunk. They must be accessible constructive participants to the entire Catharsis Tree. Trunk members will liaison with at least one branch regularly, and approve staffing for Catharsis if needed. The Trunk will also decide if any Trunk member should be removed with a majority vote needed to call the question and 3/4 majority needed for removal. Special elections for open seats will be held within 30 days of a vacant seat for any reason, including resignation. Also the Trunk will enhance and protect standards of conduct on matters such as sexual harassment, violence, and other unacceptable behavior of individual volunteers and groups working with the Catharsis Tree. To serve the Catharsis mission effectively, we believe the Trunk should be diverse and represent an intersection of communities and identities. To that end, Trunk should seriously consider (in conversation with Roots and relevant community members) dissolving and reforming via new elections if members do not make up a diverse and representative set of identities for the Catharsis communities. We recognize at the current time (February 2018) this is somewhat aspirational given the realities of our culture, leadership and engaged communities, and seek to do the real, uncomfortable inclusionary work necessary to broaden and diversify our leadership in meaningful ways. Roots will consist of the current (2017) board members and over time the Roots membership and role may grow or shrink at the determination of current Roots members. Roots are intended as an experimental (and, potentially, transitional) structure, in ongoing conversation with the Trunk and community. The Roots’ intended role is to defend the core values of Catharsis, cultivate and encourage new Trunk members, and ensure continuity and accountability around Trunk elections. Informally, the Roots are an advisory group that are available as desired by Trunk and may attend any Trunk meetings (no vote, expected to take a backseat in conversation as “ex-officio” members). Formally, the Roots may veto changes to bylaws or other core decisions by the Trunk (e.g. budget, theme) with a full 3/4 majority of Roots members. There can be no unilateral change to The Root’s veto check organizational role by the Trunk.